Coin Magnifiers are a integral part of coin collecting. These glass coin magnifiers will help you grade your coins more accurately and will bring out even the faintest detail. 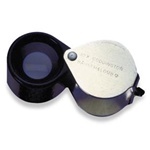 We carry some of the best magnifying glass for coins by Bausch and Lomb and other top manufactures.